Easy to clean, modern, and cost-effective, acrylic makes a fantastic splashback material. Available in a huge range of colours and effects, you’ll have no trouble finding the right shade and style for your kitchen. Best suited to contemporary spaces, an acrylic splashback in a bold colour like red, yellow, blue or green can add real flair to an otherwise-monochrome kitchen. Glass is another chic, modern splashback material. You can choose coloured glass or glass with a design on it – or if you’ve already got painted, papered or tiled walls and just want to add an extra layer of protection, a sheet of colourless glass fitted above your hob will stop your décor sustaining any damage. Metallic finishes have increased in popularity in interior design over the last couple of years, and there’s been a shift from chrome and stainless steel to warmer-toned metals like copper and brass. If you love cooking and fancy yourself as the next Masterchef winner, feel like a professional chef in your own kitchen with a stainless steel splashback. 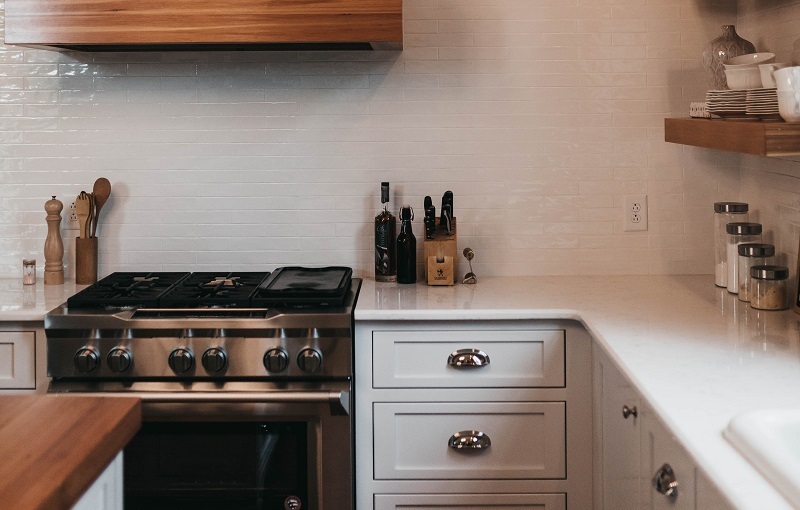 Stainless steel is best suited to modern-looking spaces – so if you live in a period property, it may not suit your kitchen. If your cooking space is a little bit more traditional in style but you still love that metallic gleam, consider a copper splashback. It will catch the eye and will add a touch of warmth as well. Metro tiles became somewhat ubiquitous a few years ago, but they still have plenty of appeal. In white, they give any room a chic, fresh, understated look. Pair with rustic-style kitchen doors in a soft grey – like the Washington door in Light Grey – and another pale grey on the walls for a muted, soothing ambience. Or if you fancy a look with a touch more drama, choose metro tiles in a dark colour and plan the rest of the room around that. Green tiles look great with Graphite or Legno Jet doors and brass handles, while blue metro tiles would look fantastic with marble-effect worktops and white unit doors. Encaustic tiles have become more widely used this year, but what actually are they? Well, they’re patterned tiles, but the designs are made with coloured clay – so the pattern is worked into the tile itself, rather than painted on. You can use them on floors and walls, in kitchens, bathrooms and hallways, but why not use them create a unique, eye-catching splashback? You can get encaustic tiles with simple patterns – just a couple of colours – or you can choose something more elaborate.